Iowa Department of Transportation officials have unveiled a $3.4 billion plan to support roadway and bridge projects over the next five years. Iowa DOT presented a draft of the 2019-23 Transportation Improvement Program to the state Transportation Commission on May 8. The commission is a seven-member body that crafts transportation policy and identifies transportation needs. In part, this plan will fund interstate reconstruction projects in the western part of the state, according to Stuart Anderson, director of Iowa DOT’s Planning, Programming and Modal Division. Council Bluffs and Sioux City, which sit along the western border of Iowa about 100 miles apart from each other, are both sites of major road projects. Three interstates — I-80, I-29 and I-480—run through Council Bluffs, which is located directly across the Missouri River from Omaha, Neb. According to Iowa DOT’s website, the Council Bluffs Interstate System typically carries between 20,000 and 75,000 vehicles a day. Iowa DOT is adding capacity to and straightening the lanes of these interstates to account for the increased traffic the area anticipates by 2030. From Council Bluffs, a traveler could follow I-29 north for 95 miles and reach Sioux City. No major roadway improvements have been made to the portion of I-29 that runs through Sioux City since 1961, according to Iowa DOT’s web page on the route’s improvement project. The agency is widening portions of I-29 from four lanes to six, reconstructing interchanges and upgrading several ramps. Completion of this project is scheduled for 2019. Paul Martel of Crawford Trucking Inc. said these expansion projects will offer much-needed congestion relief in the western part of the state. Founded in 1990, Crawford Trucking is based in Des Moines. “It gets a little tight over there,” Martel said. Iowa DOT’s construction projects extend beyond interstates. Anderson told Transport Topics that the agency plans to finish widening U.S. Route 20 across the state this year, a project that has been on the books for decades. 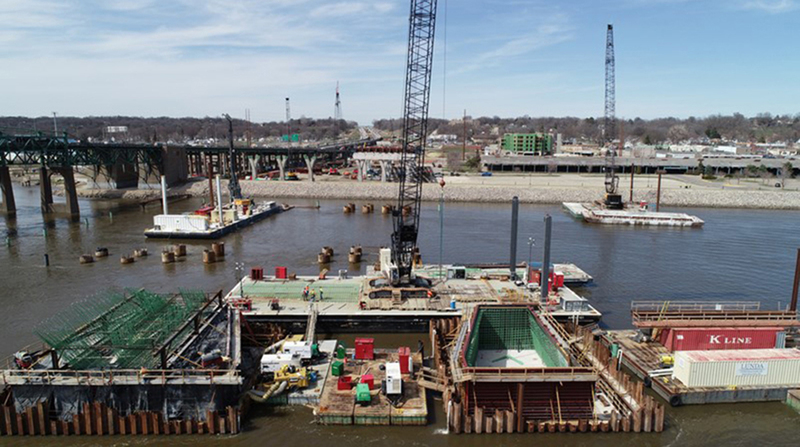 Additionally, Iowa DOT will continue work on the I-74 bridge, a tandem project of the Iowa and Illinois departments of transportation which aims to increase capacity and facilitate mobility by widening the structure from two lanes to four. The I-74 bridge, which traverses the Mississippi River, consists of two spans that run from Moline, Ill., to Davenport, Iowa. The two cities help make up the Quad Cities area, the region where eastern Iowa and northwestern Illinois meet. The I-74 bridge handles about 74,000 vehicles a day. Danielle Mulholland, I-74 project manager for Iowa DOT, said 45% of the trips that move through the Quad Cities area and over the Mississippi River use that bridge. The Iowa Transportation Commission is scheduled to vote on Iowa DOT’s proposed plan next month.